The key to personal branding is showing proof of your ability. 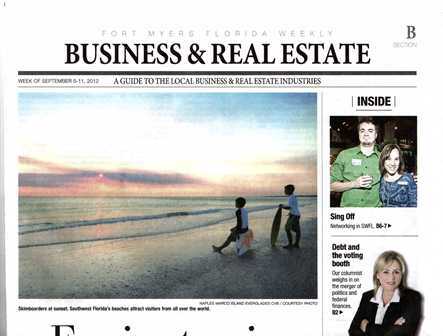 I am honored to announce that I have been highlighted in a story from the News-Press in their Coastal Life Section. The article was published on Friday, November 23rd, and tells the story of a dedicated professional who works hard while enjoying his sunny new life in Florida. I am excited to be on the Stickboy Creative team and pumped that my efforts have led to an article after only four months of living in SWFL! Follow the link to read the article in the News-Press and see my dedication to doing what is right for each and every person I meet. Stickboy Creative is a cutting edge Design Company specializing in Website Design & Development, Print Design and Print Management, Animation, Video Production, Identity Branding and much more. We are a one stop shop for all of your company marketing materials and we do not disappoint. Stickboy Creative was established in November of 2007 and has been growing at a rapid pace. Please contact us at 239.206.1193 or toll-free at 888.758.5558 to get a website that will make you bold | innovative | now. FYI, since the publishing of the article is has already turned into direct business for our firm. Thanks, Florida! This is a scan of the actual paper from the News-Press. Though I am still fairly new in the Fort Myers metro, I am so excited and thankful to have has such early success. Of course, the credit goes to God, my new friends in the area, and an awesome team at Stickboy Creative! The image is from this past week’s Florida Weekly, a news magazine that includes local columns, such as this from the Fort Myers business section. Somehow, though I am still a newbie to the area, I made the front cover. Woo hoo! I am excited to continue networking in the area. Just sharing for some fun. Thanks! Originally posted on March 27, 2012 at Pro/Vision Coaching. On Thursday, March 22, I gave a training presentation on marketing to a group of CB Bain Agents (both live and watching online). In it, I addressed such marketing topics as Target Audience, Marketing Message, Marketing Strategies, and Evaluation of Methods. I also discussed the psychology behind marketing and spoke about things like the concept of demand resistance (why don’t people follow through? ), the reasons people buy (pain vs. pleasure), and how the human psyche handles purchases. The entire presentation can be seen on the link. Enjoy! *Originally posted on October 13, 2011 at Pro/Vision Coaching. Thanks again to Jen Westby and Julie Wells for having me on the show – I hope that I was able to provide some insight and support to all the listeners out there! Originally posted at Pro/Vision Coaching. Linda has consistently been a solid producer for her non-profit organization, At Work, where she is a job placement specialist for people with developmental disabilities. She believes thoroughly in networking for her business, which is where we met her. Linda became one of our first Academy clients, starting in the Networking 4 Introverts support group as well as taking the Time Management Workshop. Through those tools and the time she has spent with myself (Phil) and Paul, she has seen a significant increase in her time efficiency and marketing presentation, both of which have led to a major upswing in job placements. Over the last few months Linda has gone absolutely gangbusters and all of us here at Pro/Vision Coaching are super excited for her and the continued success headed her way. We look forward to a continual relationship with her, as she has not only become a client, but a friend. Congrats, Linda! OMAHA, NE, 6/1/2011 – Pro/Vision Coaching is making a major push forward in its company growth by expanding its services in the Seattle Metro area. Starting June 1, Phil Stalnaker will not only lead the marketing efforts, but utilize his coaching certification to facilitate the launch of the Pro/Vision Academy. In addition to our regular one-on-one business coaching programs, Pro/Vision Coaching is launching a business academy in the Seattle Metro, based on the needs of the business owners in that area. The Academy offers programs ranging from support groups and book clubs, business courses, workshops, and even mastermind groups for like-minded owners and their key employees. “The Pro/Vision Academy is an unprecedented change to the business coaching industry, and with its launch in Seattle, we need to make sure it is properly staffed and equipped.” commented Doug Christy, Pro/Vision Coaching’s co-owner. Working with Phil on the Academy is Paul Hajek, a successful life-long entrepreneur and business coach since 2005. “This is the adventurous part of my corporate responsibility, helping institute the Pro/Vision Coaching model to the geographic locations within the Christy’s vision.” said Phil Stalnaker. Honing in on a way to develop business owners into successful entrepreneurs even before they start their first business is a key stabilizer to a shaky market economy. With the Academy, Pro/Vision will now be able to work with people in all stages of business ownership, leading to better returns and ultimately better business for all.